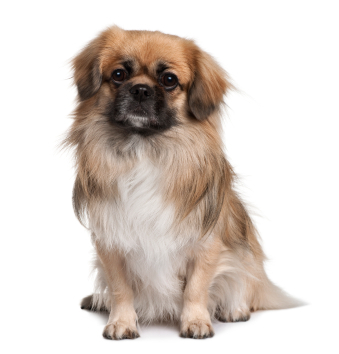 Learn about the temperament and personality of the Tibetan Spaniel. Discover what he's like to live with, his traits and characteristics and how he generally behaves. And look at lots of Tibetan Spaniel photos. The Tibetan Spaniel is a reliable little watchdog and lapdog. They are active, alert, lively, happy, and intelligent. They thrive on human companionship and need to be with their people. They are incredibly affectionate and devoted to their families. They simply love to be with you. Yet, they can be independent thinkers, and have been known to open doors and purses. They like to please you but they also like to do things their own way. And if they get bored, they will probably eat your shoes. They are especially reluctant to come when you call them, so they do best walking on lead or playing in a fenced-in area. Tibbies have been accused of being stubborn. They do mature slowly. While they are friendly and outgoing with their families, they are aloof with strangers, and will bark if anyone approaches the home. Yet, they are not prone to yap unnecessarily. Mostly, they like to lie around all day peering out the window, and they will often climb up onto the back of the sofa or the dining room table to get the best vantage point. Tibbies only need moderate exercise. A daily walk will satisfy. They do well with children, but interactions should be supervised, as young children might accidentally injure a small Tibetan Spaniel. They do well with other dogs and animals. They are famous for being able to understand and respond to your moods and feelings. Some recommend that you don't fight in front of your Tibbie, as he will become the most upset of anyone involved. They love to give kisses by licking your face and they love to cuddle up in your lap. They can live anywhere, in a mansion, or an apartment. As long as they get to be loved. Oh, and they will want to sleep in your bed too! The Tibetan Spaniel is moderately easy to train. He learns new commands at the average rate. He is neither difficult nor easy to train. The Tibetan Spaniel sheds a fair amount of hair. You'll find hair stuck to your couch, carpets, clothes and everything else in your home.